The poet’s “host of golden daffodils” come to mind when spring bulbs are mentioned but for pink, blue or white blooms at the end of winter, there are lots of alternatives. Thinking pink could be tricky, I thought, but my list of those with pink blooms soon grew so long that the challenge was what to leave out. With more than 25,000 named varieties, it’s understandable that narcissi dominate the spring-bulb line-up. Most are gold or yellow- and-white but there are many with pink cups. ‘Fencourt Jewel’ is a unique New Zealand-bred tarzetta, but if $100 a bulb puts you off, less expensive ‘Chanson’, ‘Dailmanach’, ‘Lilac Charm’, ‘Tranquil Image’, ‘Hey Jude’ or split corona varieties ‘Trans American’ and ‘Astrodome’ are appealing, too. 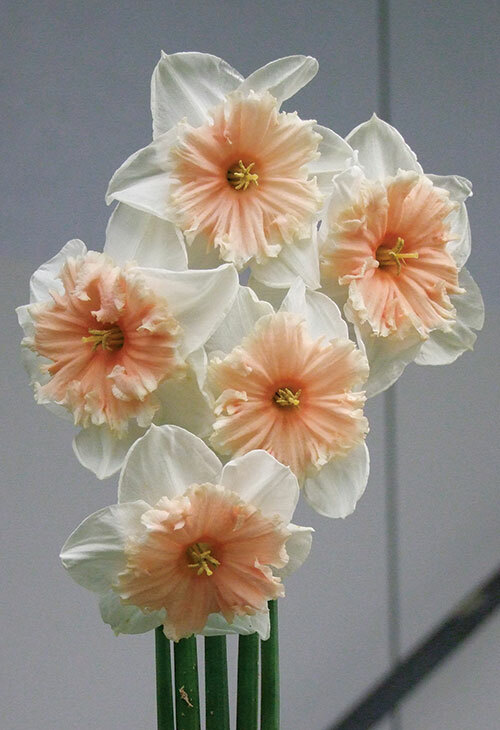 'Astrodome' is a split corona daffodil. Veltheimia capensis looks a little like a red hot poker. Daffodils make great massed displays, as do tulips, although the latter are most suitable in areas which have cold winters. Pale pink tulips include old favourites ‘Pink Diamond’ and ‘Pink Perfection’ double ‘Angelique’, ‘Passionate Double’ and ‘Hermione’ are always sought after ‘Camargue’ is cream with fine pink stripes ‘Carola’ is a plummy single, while ‘Mascotte’ has fringed petals. If you can track them down, two worthwhile species are Tulipa aucheriana and T. saxatilis, both of which have yellow-centred pink blooms. Pink tulips with cream hyacinths and blue Muscari. As long as they don’t get too hot, tulips grow well in pots outdoors, while for indoor containers, tender Hippeastrum – sometimes wrongly called amaryllis – is the king. There are some lovely pinks, like ‘Apple Blossom’ and double-flowered ‘Aphrodite’, whose creamy petals are edged in pink. If you put potted specimens inside now, they will bloom in winter. Grown outdoors in warmer areas, they flower in spring and if left undisturbed clumps get better every year. Also hating the chill of winter and therefore suitable only for frost- free areas or greenhouse culture, is a rarely seen South African dream boat, Veltheimia capensis. 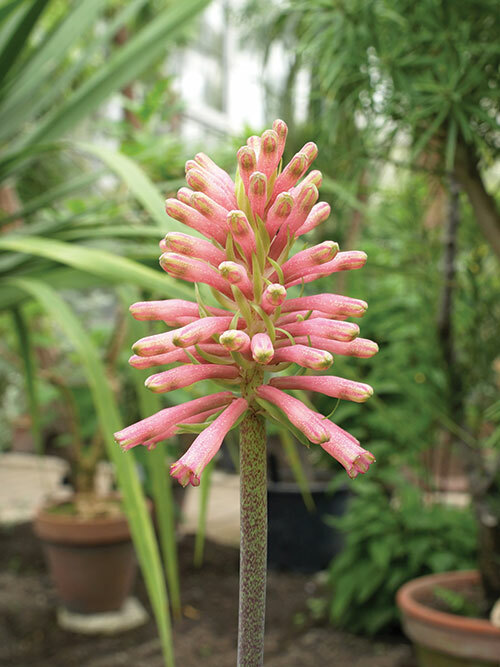 Pink flowers on 45cm stems give it the appearance of an upmarket red hot poker (Kniphofia). 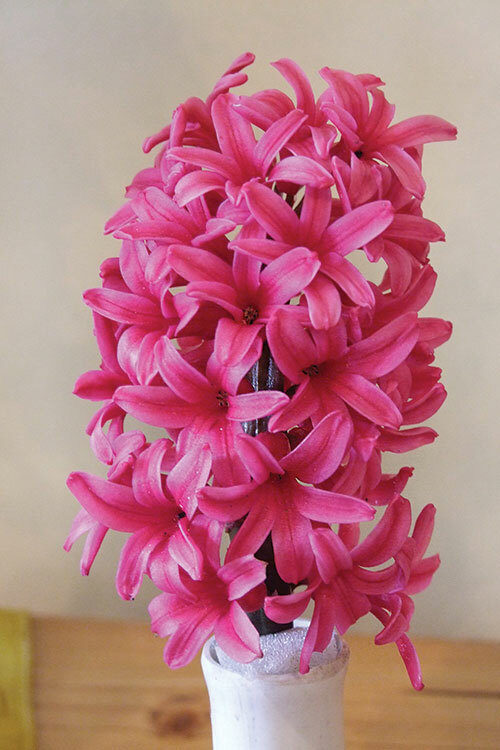 Hyacinths are probably the most popular indoor bulbs. However, the most popular bulbs for indoors have to be hyacinths and there are named pinks (‘Fondant’ is a pretty soft shade). Unfortunately, their intense perfume can give some people an adverse reaction. 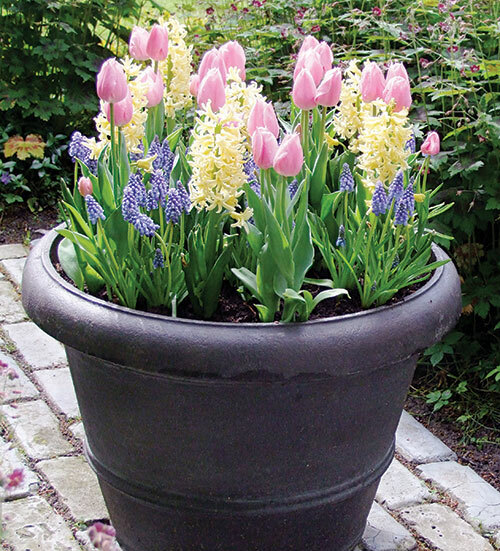 If so, grow hyacinths outside in pots or in the garden where rich soil suits them best. Freesias once had intense perfume, too, but modern cultivars lack the punch of the oldies. 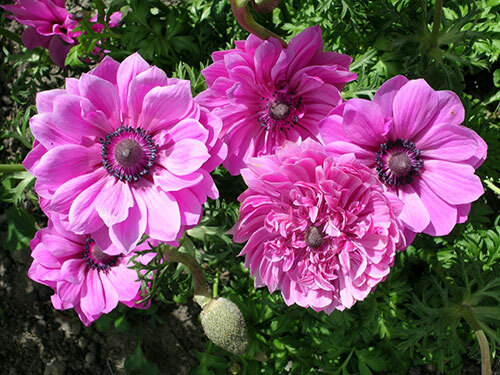 However, the newbies – bred for colour, bloom size and long, strong stems – include good pinks, equally at home in the flower bed or a container and excellent cut flowers. Another choice for picking is ranunculus. They look good en masse in a sunny part of the garden, too. Sadly, they seem to be somewhat out of fashion at present, unlike anemones (A. coronaria), whose odd little corms are grown point down. Tip: if you can’t decide which way is up, put it on its side and the clever wee thing will sort itself out. 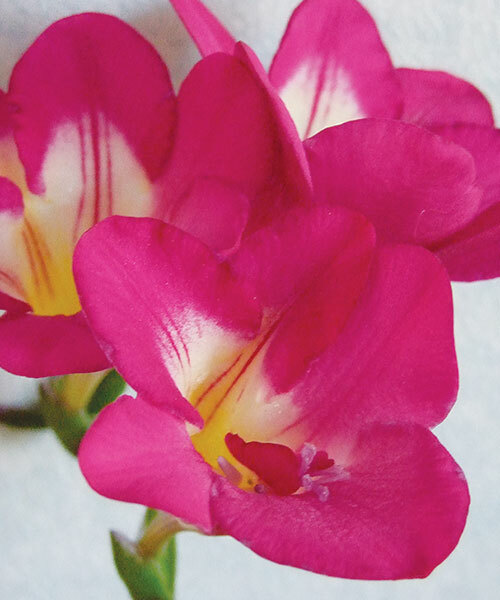 Modern freesias include strong pinks. Get down on your knees for two other anemone, A. neorosa and A. blanda, whose pink form is a Grecian baby that grows to about 10cm. Ideal corms for cool, semi-shaded areas, they multiply readily if left to get on with it. Stay where you are to admire two other little gems that like similar conditions, pink dog’s tooth violet (Erythronium dens-canis) and – a change from the usual blue – chionodoxa. The flowers of two tiny South Africans, Rhodohypoxis baurii and Romulea rosea, open with the sun and are perfect for shallow pots, while the little Mariposa lily (Calochortus venustus) thrives if the soil is sandy. The most variable of this North American species, sometimes called butterfly tulip, it has flowers of white, yellow, lavender, purple or pink, which – like most Calochortus – can be cut for a vase indoors. They’re not easy to find but something a bit different in spring. Easier to obtain for sunny spots are two vigorous early-flowering alliums, the 20cm Turkestan onion (Allium karataviense), notable for its broad, greyish leaves and ball-shaped flowers on short stems, and taller (40cm) American garlic (A. unifolium), whose flowers and grassy leaves can be added to salads. Finally, let’s slip back into semi-shade, where the two easiest-to grow fritillarias make themselves at home. Fritillaria meleagris is notable for checked patterns in mauve-pink, while F. pontica has green flowers with pinkish stripes. I admit neither is truly pink, but they are lovely, like so many spring bulbs. Grow anemone corms with points facing down. Bulb availability will vary by Mitre 10 store, speak to your friendly team in store.